Sunday mornings can be tough for families. Many times, Saturday has been filled with fun activities which can include staying up late. When Sunday morning gets here, it can be hard to get out of bed. So it was for the Greene family this morning. As the rest of us were up, getting ready for church, Sam was still in the bed. He was dead to the world. Time was ticking and I was growing impatient because the Lord knows how much I hate to be late. After I had called him FIVE times, Sam was still not downstairs. He had let out an occasional grunt to let me know he heard me, but he was still dreaming away in his comfy bed. When you’re trying to motivate a 12 year old boy to obey, you use whatever arsenal you can find in your brain at that moment. Sometimes things come out of your mouth that you did not plan for. It is also quite possible that sometimes as a Mom, I may overreact from time to time. 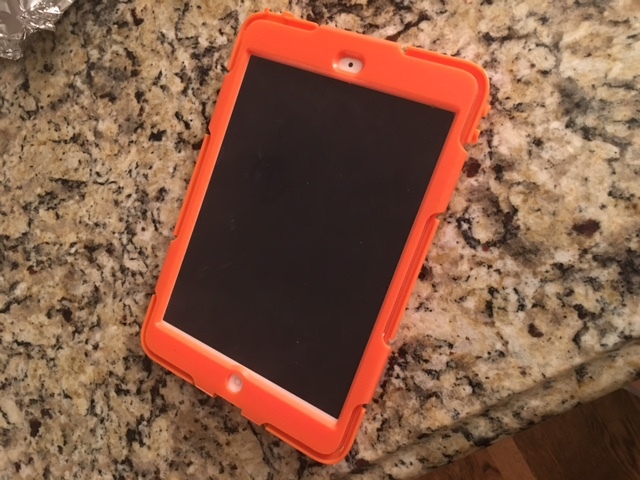 Have you ever seen those videos of parents who get so frustrated with their kids and their electronics that they destroy them (the electronics, not the kid)? I saw a video several months ago of a Dad who was at the end of his rope with his son. The Dad was so outdone by the amount of time his son spent on his gaming system, that he took the gaming system out into the yard and ran over it with his lawnmower. I guess this video stuck in my mind as a possible new parenting technique. When Sam did not respond to me for the fifth time this morning, I had reached my “nice Mom” limit! Ok, let’s wait just a minute here. In hindsight, I probably overreacted and could have thought of a more loving (and less destructive) way to get Sam out of bed, but it was effective. Sam got out of bed….and fast! Plus, he accomplished everything I asked him to, with his Bible in hand ready to go to church, on time. Now, I’m not advocating that we take our kids’ belongings and run over them with our cars, but I am advocating that we take seriously the role we have as parents to teach our kids to obey. I think this is one of the most difficult things we deal with as parents, because as human beings, our nature is to disobey. We see this from the beginning of time with Adam and Eve. They disobeyed God. When we continue to look into the Bible, we see this same theme of disobedience with the Israelites. I am reading through the Bible this year and I just get flat worn out with these Israelites. Over and over, they did not listen to God. In so many instances their hearts were not set on following Him. In fact, they wandered around in the wilderness for 40 years because they had not obeyed God, and they missed out on a BIG blessing because of it. Might we take notice that there are consequences to disobeying God? God is always faithful and loyal to His people, but His people are not always faithful and loyal to Him. Isn’t this still true of us, today? We love God. We believe in His son Jesus and we follow Him. Yet, we struggle with doing what God tells us to do. Too many times we do what we “feel” like doing instead of doing what God commands us to do. As far as parenting goes, my encouragement to you today, my friend, is to not give up. Whether it’s getting your child out of bed in the morning or dealing with things much more serious, parenting can wear you down. As Moms, we make mistakes, but when you and I fall down, we must not stay down. You and I will battle with our kids over their disobedience. It is a battle we must fight, with love, as we obey God in our calling as Moms. Remember, if a child will not obey a parent they CAN see, how will they ever obey a God they CANNOT see? Just like God loves us and He promises to never leave us, our kids need to know how much we love them and how we will never leave them. We may run over their iPads with our car, but we will always be there for them. I love that you are so real, Joy! This was awesome—just what I needed. Thank you!